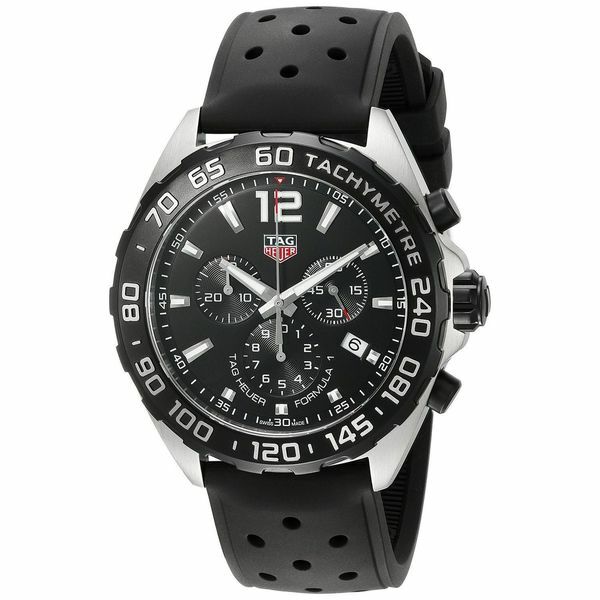 Enjoy Tag Heuer's timeless quality, style, and functionality with this sophisticated watch. Featuring a black rubber strap and stainless steel case and caseback, the watch offers modern, efficient style, and the black dial and subdials provide precise timekeeping. The watch is water resistant up to 660 feet for an adventurous lifestyle. This watch comes from some place in Brooklyn, NY called Watch Master USA, be prepared to wait over a week for a refund and still waiting. The watch comes in a Tag Heuer box but do not expect the watch to have any protective tape/etc. The unwrapped watch will just be placed in a Tag Heuer box. item was brand new as stated. all box, documents, etc. Except for the Warranty Card since Tag Heuer does not offer warranty card on third party sellers, so beware of this if you are one of those who like to have the official warranty card, since they only include it when its an authorized reseller. other than that, i purchased the 2 year warranty from overstock, so shouldn't be an issue. Happy with the watch. Solid watch construction. Comfortable and the features I use daily. Sporty looking but the TAG name says your a step above! I am returning this watch, so my review is based on the time I had it. The watch is beautiful, but it comes without tags and had the wrong warranty card with it. The box was also in poor condition, when you are spending this much money I would have expected it to be in pristine condition. The watch is new. The watch is beautiful. However, I received a used/opened watch and it has been a hassle to get returned/exchanged. You can't go wrong with this watch itself. This watch was a birthday gift for my Aon. He adores it! Thank you overstock for making it possible for me to find watch at such a great price that I could make his dreams of owning a TAG come true! You are all super nice when I call and always deliver on time! Looks great and I get so many compliments. Shipped super quick and looks very expensive. Watch is perfect size and very lightweight. Much cheaper than any local retailer also! Arrived on time !! Beautiful watch!! My first foray into a very luxurious watch. I am not disappointed. This was a birthday present to myself. I am amazed.......I was a little concerned but everything is positively perfect. I cannot wait to give it for Christmas. I will definitely order from these folks again......without hesitation! It was packaged perfectly for shipping! Thank you so much!